Something a little different. It is in fact a BSA B40 despite what it says on the tank, AFS stands for Auxiliary Fire Service. The AFs was disbanded in 1968 and all of their vehicles were returned to MOD stores. many were sold off at public auctions later. Many being bought by dealers who "civilianized" them before selling them on. A few managed to keep their original livery. 71' A-65. Previous owner had the engine all sorted out, but there was a crap paint job done a few years ago. Always been a fan of chrome, so I had the fenders and tank and side engine panels chromed. I painted the tank alloy strip in a red clear coat finish. Currently having mufflers and an after-market oil filtration system installed at Frank Deihl's Classic Cycle Works in Georgetown, SC. Bike starts and runs great, and it gets a lot of attention everywhere I ride it. 1936 W6 Work in progress. Many thanks to Ed V, Doug W, and the BB Forum members. 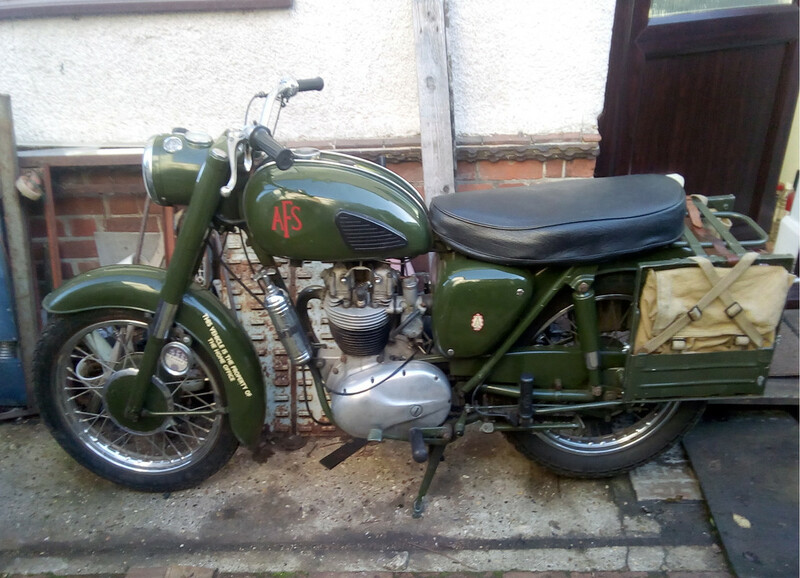 Could someone here tell the model and year of this BSA?